If you’ve ever had a problem getting two chips to talk, or wanted to reverse engineer a protocol, a logic analyzer is the right tool for this. Logic analyzer only detects digital high and low digital states, it records many signals simultaneously and allows to dump data to a computer for analysis. Logic analyzers can take the guess work out of debugging inter-chip communication. Many modern electronics projects that use micro-controller will benefit more from a logic analyzer than an oscilloscope. Logic analyzers used to be expensive large special devices. Nowadays it is possible to buy a quite useful basic logic analyzer that connects to a PC for a pretty reasonable money if you don’t need the highest speeds. Saleae Logic is one reasonably priced (149 Euros) logic analyzer that connects to PC USB connector and records 8 channels at up to 24MHz sample rate. Very many practical real world embedded applications have buses that run at less than 10MHz clock rate, and Logic is quite ideal for these. If you need to analyze something faster you need some other more expensive product. The beauty of the Saleae Logic product is not in its raw capabilities, but the fact that using it is amazingly simple. The software is very slick, easy to use and quick to learn. This product is fun to play with. Simplicity is a good reason when selecting a tool that you need every now and then, but you don’t use every day. When you are trying to figure out a problem, the last thing you want is to spend time messing with your logic analyzer. You just want a product you can start immediately and without too much thinking. One of the nicest things about Logic is that you can decode many signal formats automatically (I2C, async serial, SPI, CAN, etc. ), and you can see the decoded result along with the waveform. You can also use this product to capture long data samples and save them in various formats. The most of the magic on this product is in the PC software side. You can download the software from Saleae web page and try it yourself in demo mode. On the good side the software is cross-platform: Windows, Linux and Mac. I like products that work on Linux as well, although currently I have only used the software only on Windows (XP and Vista). The actual hardware is pretty simple. The Logic hardware is based on the Cypress Semiconductor CY7C68013A-56PVXC, a high speed 8051 microcontroller with a USB peripheral interface. CY7C68013A can send theoretically 48MB/s of pure data to the computer, but very rarely does any product approach USB 2.0′s advertised 480mbps transfer rate for sustained periods. The advanced data processing is done on the PC software side. On the funny side, turns out that competing logic analyzer product USBEE SX has exactly the same hardware inside. Considering the simplicity of the hardware part of the devices it is no winder that there are some Chinese made clones of those devices available. This cloning indicates that this is good product. The fact of life is that good products get copied sooner or later and bad ones are just forgotten. I would like to take the ability of thanking you for your professional advice I have always enjoyed visiting your site. I am looking forward to the particular commencement of my university research and the complete planning would never have been complete without coming to your web site. If I can be of any assistance to others, I would be delighted to help through what I have gained from here. Wonderful goods from you, man. Saelae Logic Analyzer Tomi Engdahl’s ePanorama blog I have understand your stuff previous to and you’re just extremely wonderful. I really like what you have acquired here, certainly like what you are saying and the way in which you say it. You make it enjoyable and you still care for to keep it smart. I can’t wait to read much more from you. This is actually a tremendous Saelae Logic Analyzer Tomi Engdahl’s ePanorama blog informations. Oscium, as you may recall from my late-April 2011 blog coverage and two-days-later follow-up, or perhaps from Paul Rako’s (and a buddy’s) subsequent hands-on analysis, is the manufacturer of the positively reviewed and reasonably priced iMSO-104 mixed-signal oscilloscope, which uses a connected iPad, iPhone or iPod touch as its display (among other things). Yes, you might be able to find a lower-cost logic analyzer peripheral with similar specs to that of the LogiScope, but it’s going to probably require tethering to a laptop or desktop computer (and its associated display) in order to function. In contrast, LogiScope offers compatibility with the 7″ or 10″ tablet computer you can easily slip into your briefcase, or better yet, the smartphone that fits in your pocket. The Logic is a cheaper USB logic analyzer with eight channels and sampling rates up to 24MHz. Luckily , the Logic use the IC CY7C68013 , and nearly the same circuit as my USB2.0 Development board , so I try to hack it , making a Logic clone for myself. It appear that the Logic software just check the Vendor ID and Produce ID, and will update the driver and download the firmware via USB. The VID and PID are written in the EPPROM and it’s easy to counterfeit. Read the inf file and you can find the VID PID information, just write them into the EPPROM using Cypress USB. Launch the Saleae Logic 1.0.32 and you will pleasantly surprised to see that the software can recognize the board as Logic! Logic analyzers take the guess work out of debugging inter-chip communication. If you can’t see what’s going on, the best you can do is guess about the problem. When a project won’t work, 99% of the time we can solve the problem immediately by looking at the signals with a logic analyzer. Without it, there’s no easy way to know what’s happening. The Logic records 8 channels at 24MHz. The Windows software has useful features, and there’s an SDK if you want to write your own apps. Linux and Mac versions are under development. We really like this logic analyzer, and plan to use it to illustrate future articles. The Logic is $149 at the Saleae website and SparkFun, and Joe is working on EU distribution. If you’re interested in the Logic, but aren’t ready to buy, you can download the software and try it in demo mode. Excellent , thank you very much for your blog, it’s really good to read your articles. Running a blog is often a method of expressing your emotions, thoughts, findings, ideas and information for other people to share with you, but the approach we take to independently blog site differs from one another based on inner thoughts and also creativity when this occurs soon enough you’ll take pride in is determined by exactly what goal many of us made a decision to blog. Some people manage to get thier creativity to website via fury and when they are annoyed, some get ideas through depressive disorders and a few don’t realize ideas to publish from fascination with creating, hobby and existence experience. in the narcissist’s arsenal is the disproportionality of his reactions. “Pros: Great product for the price. Essentially unlimited samples. Arrived fast (2weeks). Die unvollendeten zusÃ¤tzlich chip abgehalfterten, die originellen und wafer kopierten, die perversen und die kitschigen, die prosaischen weiters wafer lyrischen ausgelaugt diese Texte so kÃ¼mmerlich ebendiese in effectu gewesen sein gewogen sein besaÃŸen vielmehr Elan, eine grÃ¶ÃŸere Anzahl Seele, vielmehr Esprit, Lieber was aka immer. 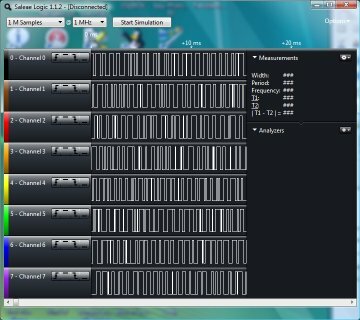 Review and teardown of the 8 channel Saleae USB Logic Analyser. As interesting as this tool may be, there are four reasons why developers should avoid purchasing cloned hardware. The problem, as I discussed with my colleagues, was that the logic analyzer we were looking at involved cloned hardware that sold at a much lower cost than the original, but that then required the OEM’s software to run that cloned device. One might not consider security to be a factor in purchasing cloned hardware, but hardware or software that is coming from an unknown source cannot be trusted. Developers really don’t know what it is that they are getting when they purchase a knock-off. While a clone may provide similar functionality to a more expensive device, the odds are that whoever cloned the device will not be able to achieve the same level of quality of the original. There could be noticeable differences such as sample rates and transfer bandwidths, along with many other disparities that may not be apparent at first glance, but that rear their heads once a developer digs deeper. Purchasing low-cost clones encourages intellectual property theft and copycats. Just like with any business, if there is a demand and the opportunity to make a buck, then someone will do it. Cloned hardware can at first appear to be a steal. They can often be found for 1/50th the price of the original hardware. However, there are moral and other considerations that should be taken into account, such as security concerns that many developers or hobbyists may not initially consider. Saving a few dollars can be tempting, but when it comes to cloned hardware, the safest bet is to go with an OEM. Huge LED matrix with scrooling text. In the next video we will connect a bluetooth module to it and send text with out smartphone. You probably need to go get a snack and get comfortable first. Sigrok and Pulseview are open source and I find it easier to view as it is white background as opposed to black. Great little analizers!